Nursery costs add up for the enthusiastic gardener, but learning how to propagate some of your favorite perennials can help save at the plant store. 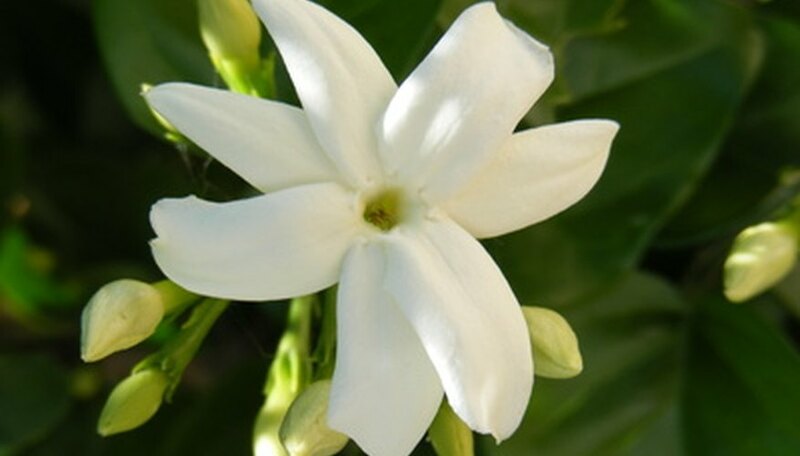 Jasmine is sweet smelling perennial vine that grows in tropical and warm temperate climates. Summer jasmine (Jasminum officinale) grows well in warm sunny areas of the garden, while winter Jasmine (Jasminum nudiflorum) will flourish in colder shaded areas and provide a splash of color when other plants are in their winter dormancy period, according to England’s Royal Horticultural Society. Take a 4 to 8-inch long softwood cutting. Softwood is new growth between three and four weeks old. Take cuttings in the mid to late spring after the plant has undergone a flush of new growth. Make the cut at a 45-degree angle just below a leaf node or bud. Mix equal parts sand, perlite and peat in a bucket. Add water until the rooting medium is damp but not saturated. Avoid compost or garden soil; these mediums contain organisms that will stress and undermine the cutting as it is trying to root. If you do use a non-sterile medium, heat it in the oven to 140 degrees Fahrenheit for 30 minutes to kill all living matter, according to Washington State University. Fill a 4-inch pot with the damp rooting medium. Use a pot that has drainage holes in the bottom. Standing water will rot the developing root systems. If you are rooting more than one cutting, fill a 10 to 12- inch pot to start five or six cuttings at a time. Water the cuttings until the soil is damp all the way though. Place a clear plastic bag upside down over the lip of the pot, and fasten it with a rubber band or string to create a humid greenhouse-like condition around the cuttings. Keep the cuttings between 60 and 65 degrees Fahrenheit and in an area where they will get indirect sunlight. Remove the plastic bag every other day and mist the leaves and the soil with water. Keep the soil damp but not saturated. The cuttings will root in five to eight weeks. When the cutting has two or three new mature leaves on it, remove the plastic. Keep it out of direct sunlight in an area that is between 60 and 65 degrees Fahrenheit. After the first three weeks, put the cutting outside in dappled sunlight for a few hours at a time. If the temperatures drop below 60 degrees Fahrenheit, bring the cutting back indoors. Slowly increase the amount of time outdoors for the first two months. Transplant your rooted cutting outside after the hardening off period. Pick a sunny spot with well draining, loamy soil. Plant Jasminum officinale, or summer jasmine, in full sun. Jasminum nudiflorum, or winter jasmine, will thrive in partial shade. If the outside temperatures are below 60 Fahrenheit, keep the plant indoors until the days are consistently warm.